I love my new front loader washer. This is my first "fancy" washer and I am absolutely am in love. For the first time ever I have been completely motivated to do and stay caught up with my laundry. It's absolutely fascinating for my two children to sit and watch the clothes wash. When the water starts pouring they yell "it's raining!" And the control locks is an added bonus so that the washing goes without interruption. I also like all the added feature for the specific type of load you are washing. Another added bonus is the money I am saving. 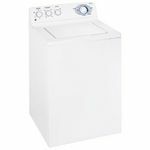 Not only am I saving on energy, but this machine also allows me to use my homemade laundry detergent, which saves me even more. Cleaning Time Depends on the type of wash you select. It can take up to 1 1/2 hours, but that is for my very soiled loads. Performance Clothes come out clean every time! Ease of Use I didn't have to read my instruction manual to operate, although I am sure it is encouraged. Design Completely transformed the look of my laundry room. Very pleased with this product! Definitely recomend. This was my first front loader and I was very impressed! The only thing I do not like is that the system clean setting pops up randomly. Usually after I have already added my detergent and laundry and there is no way to program it to run when you want it to. Energy Efficiency I haven't noticed a huge change in electricity or water usage yet. 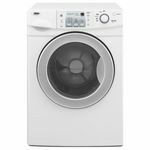 But I feel like it is more efficient than my top loader with the ability to control wash times and the extra spin options cuts down on drying time! Cleaning Time You can set it for varying times depending on the type of load you are washing. This is easily done by choosing the type of load you are doing and the level of "dirty" from light soil to very soiled. Performance No problems. Clothes and other laundry are clean! 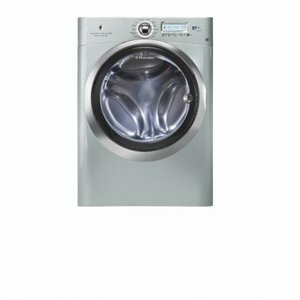 Washer has had no problems since purchase Ease of Use Easy touch controls. You can set your favorites for cycles you use most often. Design I like how you can install the door on either side depending on space. Large drum for big loads of laundry. Door locks so that cannot be opened mid-cycle Durability I forsee this lasting a long time Have not needed any service. Works Great For My Family! When my large family moved, my great aunt got this for us as a gift. The whole family is in love! My kids love to watch the clothes get washed: keeps them entertained for a while. For a large family like mine, I recommend this because it fits big loads. My kids are constantly needing to change their clothes, and I can run this all the time while feeling less guilty because it's great with saving water. It gets the clothes washed in pretty good time. Keeps me on schedule! Love this! 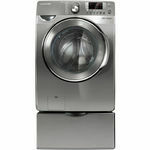 I love, love, love this washing machine. When my husband came home from a deployment, we had a lot of extra money to splurge on this washing machine, and we don't regret doing so. It is perfect. It holds a LOT of clothes, it uses very minimal water, sometimes I even find myself watching it while it's working... It's almost mesmerizing! I usually use the colors, whites, and delicates settings, and my husband uses the active wear setting. 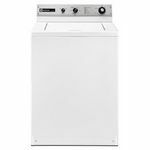 It's so easy to customize the wash cycle for each load you are doing. 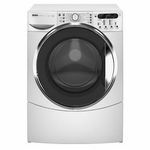 I especially like the fast wash, which will wash a small load in 18 minutes, and the delay feature, which will allow me to fill the washer and delay the start for several house, so it is freshly washed right when I get home from work and I can immediately put the load in the dryer. My husband will even do his own laundry (his gross PT uniforms) because he enjoys the washer so much. It looks beautiful in our laundry room and adds a nice punch of color (teal) to an otherwise boring room. I only wish I had purchased the matching platform for it, for the storage and the height it provides. very efficient and useful appliance. It could be used at any household, with any type of water. It takes minimum energy and performs at very high speed and efficiency level. I would highly recommend it to any family, interested in efficient quality results.